In 2019, humanity finally finds proof of extraterrestrial life when a listening post in Puerto Rico picks up exquisite singing from a planet which will come to be known as Rakhat. While United Nations diplomats endlessly debate a possible first contact mission, the Society of Jesus quietly organizes an eight-person scientific expedition of its own. What the Jesuits find is a world so beyond comprehension that it will lead them to question the meaning of being “human.” Words like “provocative” and “compelling” will come to mind as you read this shocking novel about first contact with a race that creates music akin to both poetry and prayer. There are probably a lot of book lovers out there that haven’t or won’t read this because of the “religious” aspect of the book. Please, don’t let that keep you from a truly awesome book. This book is way out of my comfort zone. Not because of the religious aspect, but because it has science fiction/fantasy/alien/space travel, none of which I like. At least I didn’t, until Trish’s read-a- long. I almost didn’t join because I truly didn’t think I’d get past the first 20 pages. To be honest, it was a struggle for me to keep reading at first. But then, and I’m not even sure at what point in the book it was, but I was reading along and was surprised to find out how engrossed I was in the book. Time had past without me even being aware of how long. I was very much in like with the book. So I kept reading. And kept reading. And then I found myself very much in love with the book. I know!! It surprised me too! In Trish’s reveiw she said “That stupid blinking cursor. Taunting me for having ALL of the things to say but not really knowing how to say any of them.” That’s how I feel. I’m not sure how to put into words all my thoughts and feelings about the book so it sounds as good as it is. So I’ll make it short and hope you decide to read it for yourself. The book has some awesome, amazing characters. It also has some awesome, amazing stuff going on that is so different from what I’m used to reading. This book showed me that I can, and do in this case, like science fiction/fantasy/alien/space travel if it’s written superbly, which this was. Do I want to read book two in the series, Children of God? Very much! Will I? I can’t say for sure because I get sidetracked a lot when it comes to what I plan on reading. Finding new to me books has a way of throwing me off course. There is so much I could say about this book, but honestly I don’t think I’d do it justice. So…my advice to you (especially if you’re not sure you’ll like it) is to borrow a copy from your library. That way you save money and you’re library always appreciates you borrowing books. If by some strange reason your library doesn’t have it, buy a new or like new used copy online. It shouldn’t cost very much. My final thought goes to Trish. Thank you for getting me out of my comfort zone. It felt good!! Thank you for being very honest and fair with your review. I have seen a couple of bloggers in the past few months refer to this, and that is how I was aware of it. Have to admit, never read this author. I like some fantasy, dystopian, etc but not sure about sci-fi space travel. I will take your word for it and see if my library has it next time I go. It seems that everyone has trouble defining this book. It’s one I know I need to read but haven’t felt the urge to read yet. Hopefully, I’ll get to it one of these days. I hadn’t heard of this one until Trish started talking about the readalong. It sounds like everyone’s really enjoyed it. I’m glad you and and Trish both mentioned about the religious aspects not being an issue. I tend to avoid any book with religious connotations because I’m always scared they’re going to get preachy! I loved this book too. There are so many things that you think could turn you off when trying to read it. As you pointed out, too many people would dismiss it with disinterest simply because it has religious themes or falls into genre fiction. But the author brings so much of her own anthropological knowledge into the story, creates powerful and compelling characters, that in spite of all misgivings you find yourself sitting on the edge of your seat. I read the sequel and it was not nearly as powerful. 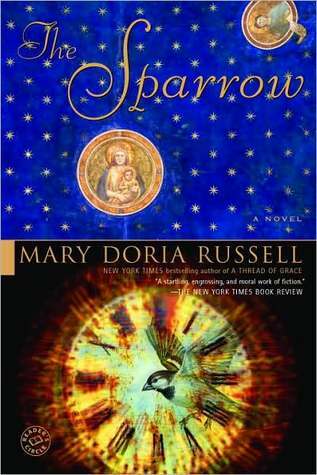 Worth reading but, if I were to reread The Sparrow I would probably not reread the sequel. Sorry to just now get back to this post Vicki! Just got back into town and am still trying to put back together my life. LOL! I am SO glad that you loved this book–and yes, I think that sci-fi, religion, space travel can be such a put off for readers so I’m glad you took a leap of faith and jumped in. Such a beautiful book with beautiful characters. I know they’ll be sticking with me for a long time! It’s one of my all-time faves, Children of God not so much. It’s been so long since I read it that all of you posting about the book lately have made me want to read it again!